(CNN) -- German side Werder Bremen moved three points clear at the top of Europa League Group L after seeing off Athletic Bilbao 3-1 despite losing Peter Niemeyer to a red card just five minutes after he appeared as a second-half substitute. 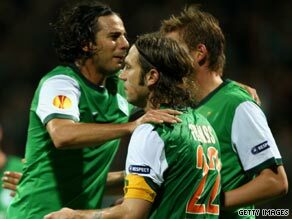 Torsten Frings (22) is congratulated by team-mates after scoring Werder's third goal against Bilbao. Both sides had won their opening Europa League matches but it was Bremen who took the spoils with a hard-fought victory after playing around 30 minutes a man down following Niemeyer's dismissal for two yellow cards. The German side led 2-0 at the break thanks to a brilliant volley from Aaron Hunt and a well-worked effort from defender Nando. Fernando Llorente pulled a late goal back for Bilbao, but the home side restored their two-goal advantage with a Torsten Frings penalty. In the other group game, Austria Vienna had to settle for a point following a 1-1 home draw with Portuguese side Nacional. Both teams had opened their group campaigns with defeats and now trail Athletic Bilbao by two points and Werder Bremen by five. Milenko Acimovic missed a penalty for Vienna 10 minutes into the game for Austria and Ruben Micael gave the Madeirans the lead after 35 minutes. An away win looked on the cards until Brazil-born Schumacher tied the game in the 76th minute. Premier League Everton shrugged off the loss of 10 first team players to record a superb 2-1 Group I victory at Belarussian side BATE Borisov -- their second successive win. The hosts went ahead with a thumping drive from Dmitri Likhtarovich but Marouane Fellaini drew Everton level from a Leighton Baines free-kick and Tim Cahill won it with 13 minutes remaining. In the other group game, AEK Athens bounced back from their thrashing at the hands of Everton as they edged out Benfica in the Greek capital. Having lost their Group I clash 4-0 two weeks ago, AEK earned their first points of the group stage thanks to Daniel Majstorovic's strike two minutes before the break. Meanwhile, in Group K, Otman Bakkal's first-half header was enough for PSV Eindhoven to claim their opening win at home to CFR Cluj. Bakkal scored the game's only goal after nine minutes when the impressive Balazs Dzsudzsak picked him out with a cross, but the hosts had to withstand a Cluj onslaught as they nervously held on. Meanwhile, in the other group game, Senegalese striker Dame Ndoye's first-half goal proved the difference as FC Copenhagen recorded their opening victory with a 1-0 win over Sparta Prague. Lazio struck four times en route to a dazzling 4-0 victory at Levski Sofia for their first win in Group G.
Francelino Matuzalem opened the scoring midway through the first half before Mauro Zarate added the second on the stroke of half-time. Second-half goals from Mourad Meghni and Tommaso Rocchi crowned a fine win for the Italian side. In the other match, Salzburg's dream start continued as they claimed the prized scalp of Villarreal with a 2-0 victory. Having shocked Lazio with a 2-1 win in Rome in their opening match, Salzburg created another stir as they beat last season's Champions League quarterfinalists thanks to goals in either half from Marc Janko and Somen Tchoyi. Holders Shakhtar Donetsk took control of Group J with a resounding 4-1 victory over an outclassed Partizan Belgrade at the Olympyiskyi Stadium. Two goals in each half, with Luiz Adriano, Rodrigues Jadson and Yaroslav Rakitskiy adding to Marko Lomic's 24th-mintue own-goal, ensured victory before a late consolation from Adem Ljajic. The result leaves Shakhtar top of the standings with two wins from two, while Partizan have now lost twice. In the other match, Ivan Perisic's stoppage-time equalizer gave Bruges a deserved 2-2 draw at Toulouse. Joseph Akpala broke the deadlock seven minutes into the second half for the Belgian side but their lead lasted just two minutes before Moussa Sissoko levelled. It looked as though Andre Pierre Gignac's 84th-minute goal would hand all three points to Toulouse but Perisic levelled matters in the dying seconds. Toulouse are two points behind leaders Shakhtar with Bruges three points further back. Meanwhile, a David Villa penalty earned Valencia a deserved 3-2 Group B win at home to Genoa to end a four-game winless streak. Unai Emery's side opened their campaign with a draw against Lille but were well worth their win at the Mestalla , although they fell behind to a Sergio Floccari goal. Valencia stormed out of the blocks in the second half and quickfire goals from David Silva and Nikola Zigic put them in front, before Houssine Kharja drew the Italians level from the penalty spot. The match was finally settled when Villa was tripped in the box with 10 minutes left and applied the finish from 12 yards. Lille came from behind to thrash Slavia Prague 5-1 in the Czech capital with all five goals coming in the second half. Tjani Belaid's early penalty had the French side on the backfoot, but they were back on level terms when Marek Suchy turned the ball into his own net early in the second half. Pierre Alain-Frau then put them ahead with 20 minutes to go before the floodgates opened in the dying stages. Yao Gervinho got the third with five minutes to go and Arnaud Souquet added another before Gervinho grabbed the fifth. Roma coach Claudio Ranieri got the result he was after from his players after they ended a run of disappointing results with a 2-0 victory over CSKA Sofia to register their first points in Group E.
The win was secured with two goals in three first-half minutes from Stefano Okaka Chuka and Simone Perrotta, following succesive draws in Serie A and defeat to Basle in their first European outing. Premier League side Fulham halted their three-match losing streak to top the group with a 1-0 home victory over Basle. Danny Murphy struck the decisive goal in the 57th minute, driving home Andrew Johnson's superb pull-back for his third goal of the season. Scottish giants Celtic were held to a 1-1 home draw by Rapid Vienna and are bottom of Group C after two matches. The home side fell behind to Nikica Jelavic's third minute goal but recovered to level in the 20th minute through Scott McDonald. The result leaves the Austrian side top of the group. Hamburg got their campaign up and running with a goal-packed 4-2 victory over Hapoel Tel Aviv. After last week's humbling 3-0 defeat to Rapid, Bruno Labbadia's side needed a win to improve their chances of reaching the latter stages of the competition. Two goals in the first 12 minutes from Marcus Berg had them in control but substitute Itay Shechter pulled the Israeli side back into the game. Eljero Elia made it 3-1 but Samuel Yeboah reduced the deficit again. Ze Roberto missed a penalty for the Germans in the second half -- but then found the target to make sure of the points. Jonathan Legear's late equalizer maintained Anderlecht's unbeaten start to Group A and denied Ajax their first win in a 1-1 draw. The game looked to be heading for a goalless draw, just as the Dutch side's clash with FC Timisoara had done a fortnight ago, until substitute Dennis Rommedahl broke the deadlock for visitors Ajax 18 minutes from time. Jelle Van Damme was dismissed in the 82nd minute, but the hosts made light of their man disadvantage and nicked a point through Legear four minutes from time. In the other match, Milan Badelj was the star of the show as Dinamo Zagreb cruised to a 3-0 victory at Romania's Timisoara. The Croatian midfielder scored the first goal and laid on the other two as his side bounced back in style from their opening 2-0 home defeat to Anderlecht.